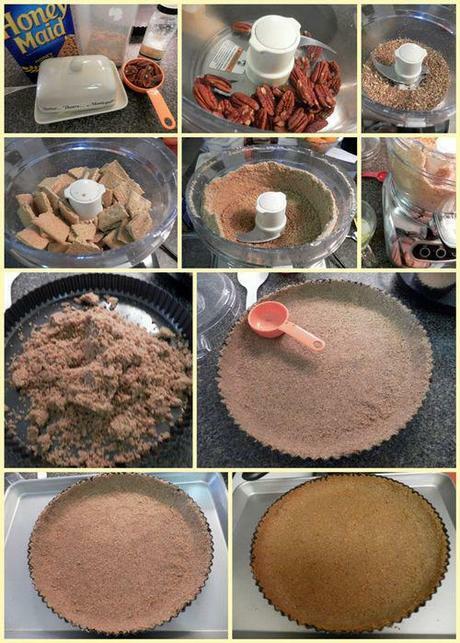 Graham-Pecan crust: 12 graham crackers (1-sleeve from package), 1 cup whole pecans, 4 oz butter - melted & 1/4 cup brown sugar. Additonal strawberries for decorating. Also, a food processor & a 9" non-stick tart pan with a removable base. In a food processor, add the pecans and pulse till it is as fine as possible. Add broken graham cracker pieces and pulse to crumbs. Add the melted butter and sugar and pulse till the crumbs are well coated with the butter and have begun to stick together. If needed half way through, using a rubber spatula give the mixture a stir and then pulse again till all the crumbs are well coated. Remove the crumb mixture to the 9" tart pan. Using a 1/4 cup measuring cup, press the the crumbs along the sides and bottom of the pan, flattening and compressing the crumbs along the bottom and walls of the pan till it is smooth, even and flat. Cook's Tip: Try to get the walls as even as possible, transferring excess crumbs from 'lumpy' portions along the base to the wall. In a microwave safe bowl, add the heavy cream, milk & 1/4 cup sugar. Microwave for about 30 seconds to heat and sugar to dissolve upon stirring. Add 1-1/2 tsp gelatin from the envelope and whisk vigorously to avoid lumps forming. Allow to cool completely before adding into the food processor. Place in the refrigerator to hurry the process if needed. 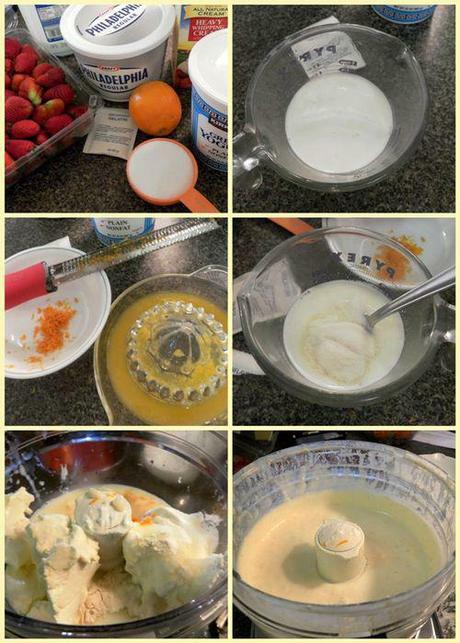 In the food processor, add the cream cheese, gelatin and milk mixture, yogurt, orange zest and remaining sugar. Thoroughly combine till creamy and smooth. Refrigerate till needed. Zest the orange and juice the orange setting aside both the zest and juice separately. Roughly dice the strawberries, if whole, discarding the leafy tops. 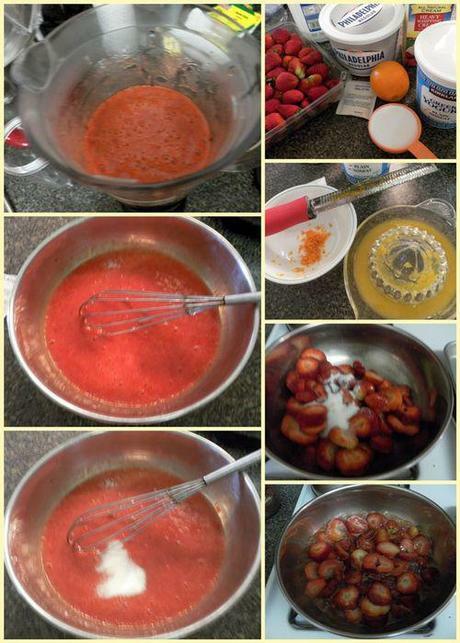 In a non-reactive metal such as stainless steel sauce pan, add the diced strawberries, sugar and orange juice. On medium-high heat, allow the fruit to simmer and slightly soften for about 5-7 minutes. Remove from the heat and set aside to slightly cool. Once the mixture has cooled sufficiently, empty into a blender and puree to a fine pulp. Return to the same sauce pan and add the remainder of the gelatin envelope (approx 3/4 tsp gelatin). Whisk and set aside to cool thoroughly. Refrigerate till needed. For a simple family dinner, simply combine the cheesecake and fruit filling with a spatula in a large mixing bowl and empty into the pie shell. For a dramatic & dinner with company, add 1/2 the cheesecake mixture into the pie shell. Spread with a spatula to fill the pie crust. Pour 1 cup of the strawberry puree and using a knife make swirls with a table knife - you don't need to be terribly precise as this layer will be covered up. Pour the remaining cheesecake mixture on top and once again spread to flatten. 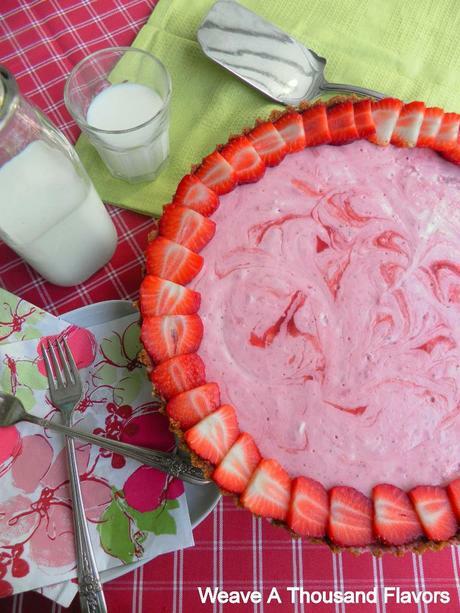 This time add the strawberry puree with a tbs measuring spoon in little dollops over the filling and once again with a clean knife, make swirl patterns all over the top of the pie. Place the cheesecake along with jelly-roll pan at the base in the refrigerator. 1-2 hours before serving : Finally, slice strawberries, eating the end slices and using the center heart shaped to overlap around the edge of the pie. Refrigerate the cheesecake for a minimum 4-6 hours or overnight. Know-how ~ Do not keep the cheesecake at room temperature in the heat or the mixture will melt and ooze once you cut into the pie. However, remove from the refrigerator 10-15 minutes prior to serving to slightly soften the filling. Nothing screams summer as this pie! What we love most about this cheesecake pie is that it isn't overly sweet and has a tart bite to it which is reminiscent of honest fruit. Absolutely delicious and wonderful for summer evenings with family and friends. A food processor & a 9" non-stick tart pan with a removable base. Remove the crumb mixture to the 9" tart pan. Using a 1/4 cup measuring cup, press the the crumbs along the sides and bottom of the pan, flattening and compressing the crumbs along the bottom and walls of the pan till it is smooth, even and flat.Cook's Tip: Try to get the walls as even as possible, transferring excess crumbs from 'lumpy' portions along the base to the wall. Carefully place the tart pan on a jelly-roll pan or cookie sheet. Place in the hot oven and bake for approx 12 minutes until the base is a light golden brown. Remove from the oven and cool. In a microwave safe bowl, add the heavy cream, milk & 1/4 cup sugar. Microwave for about 30 seconds to heat and sugar to dissolve upon stirring. Add 1-1/2 tsp gelatin from the envelope and whisk vigorously to avoid lumps forming. Allow to cool completely before adding into the food processor. Place in the refrigerator to hurry the process if needed. In the food processor, add the cream cheese, gelatin and milk mixture, yogurt, orange zest and remaining sugar. Thoroughly combine till creamy and smooth. Refrigerate till needed. In a non-reactive metal such as stainless steel sauce pan, add the diced strawberries, sugar and orange juice. On medium-high heat, allow the fruit to simmer and slightly soften for about 5-7 minutes. Remove from the heat and set aside to slightly cool. Once the mixture has cooled sufficiently, empty into a blender and puree to a fine pulp. Return to the same sauce pan and add the remainder of the gelatin envelope (approx 3/4 tsp gelatin). Whisk and set aside to cool thoroughly. Refrigerate till needed. There are two ways to proceed with the filling- For a simple family dinner, simply combine the cheesecake and fruit filling with a spatula in a large mixing bowl and empty into the pie shell. For a dramatic & dinner with company, add 1/2 the cheesecake mixture into the pie shell. Spread with a spatula to fill the pie crust. Pour 1 cup of the strawberry puree and using a knife make swirls with a table knife - you don't need to be terribly precise as this layer will be covered up. Pour the remaining cheesecake mixture on top and once again spread to flatten. 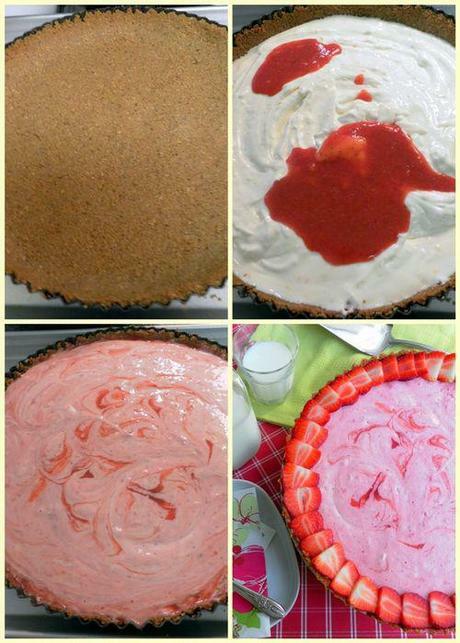 This time add the strawberry puree with a tbs measuring spoon in little dollops over the filling and once again with a clean knife, make swirl patterns all over the top of the pie.